Not to be cliché, but aren’t those the criteria we’re always looking to meet when it comes to dinner plans? Throw in some nutrients and you’ve got yourself a winner! 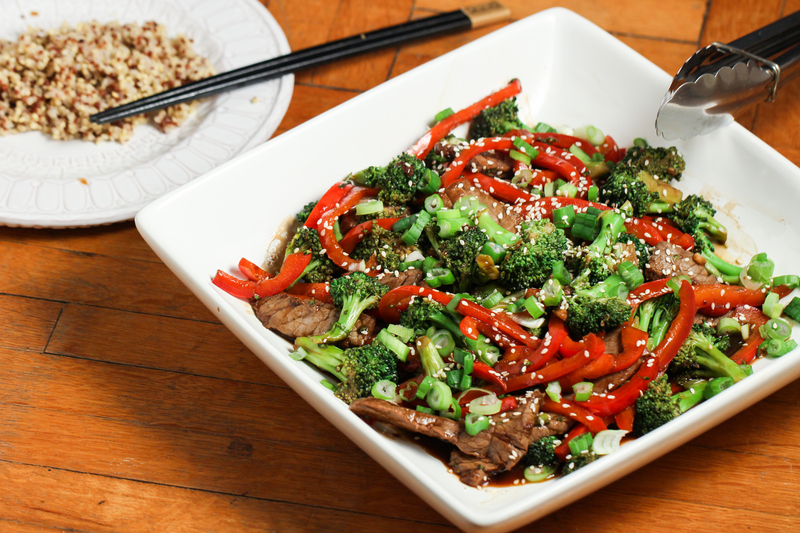 See: beef and broccoli stir fry. This is a good basic stir fry sauce to have in your arsenal. 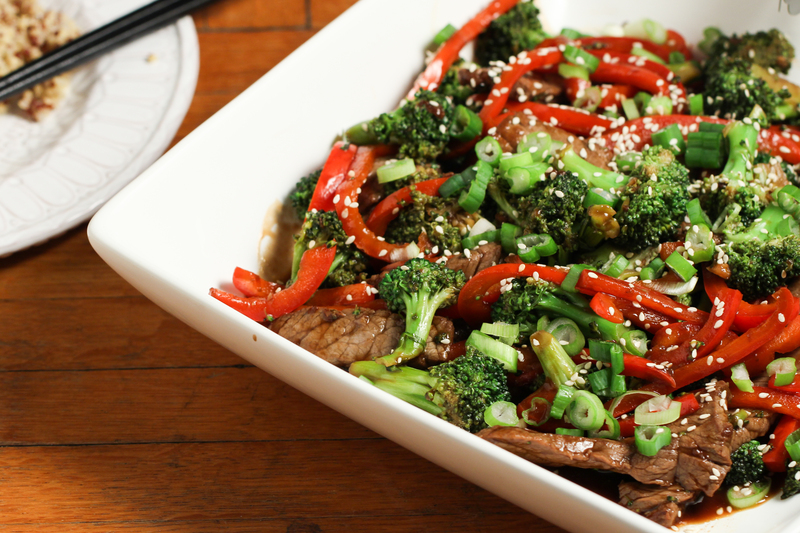 All too often we are tempted to reach for the jarred stir fry sauces (trust me, I lived off of them while in University) – but it’s quite easy to put this sauce together and then you know exactly what’s going into your gut. 2. In a medium bowl, whisk together 1/2 cup soy sauce, 1.5 tablespoons flour, stock, brown sugar, rice vinegar, sesame oil, garlic, ginger, and chili flakes. 3. Heat a large skillet (or wok if you have one)over high heat. Add water and broccoli and cook until broccoli is bright green (2-3 minutes). Remove from heat into a bowl. Add peppers to pan and cook until bright and only slightly softened. Remove from heat. 5. Add sauce to skillet (whisking first if the flour has settled), and bring to a simmer. Simmer until slightly thickened (about 3 minutes). Add cooked broccoli, peppers, and beef. Stir to combine. Top with sesame seeds and green onions. 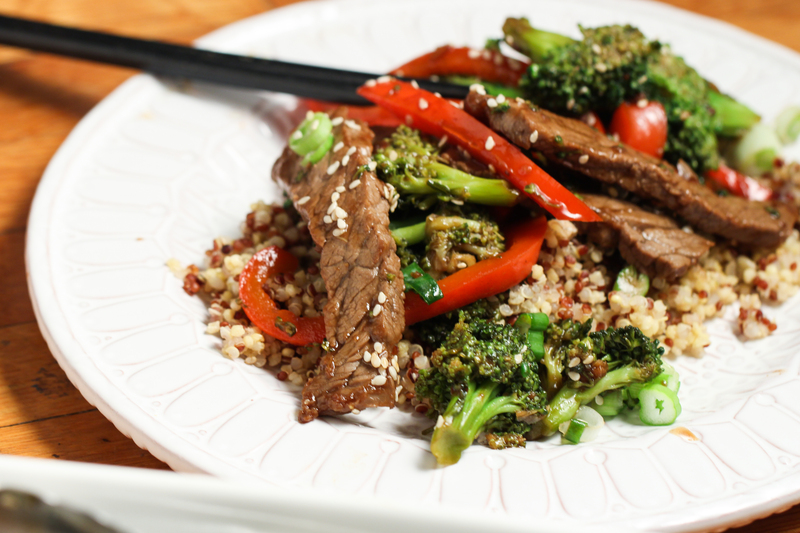 Serve with rice or quinoa. Adapted from: Iowa Girl eats via Foodie Crush (The original recipe provides you with gluten free options. I eat all the gluten so recipe written as prepared).